Today I received an email from a friend telling of an equally terrible tale of a Pit Bull who made the wrong decision to tangle with a poor little Porcupine; but being brave and stupid, he learned the hard way that you can't always win, no matter how tough you are. 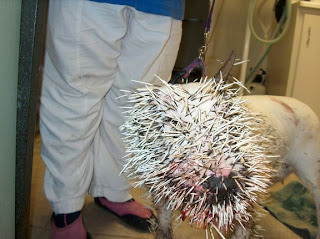 The Vet sedated the dog and removed 1347 quills...the dog survived and hopefully learned a lesson. 2. Choose your fights wisely. 3. Don't mess with Porcupines!